The Thai cave rescue & the surge of common humanity. Tham Khao Luang Cave. Sheila Dee. flickr cc. Until last month, Richard Harris was, to me, a fondly remembered Irish actor. But on the global stage, the new Richard Harris, ‘Harry’, is an Adelaide anaesthetist/medical recovery expert, and, in his spare time, an expert cave diver. He is also a man who avoids publicity and fandom. In a world in which so many are destitute and dying, where thousands die of numerous and horrific causes every day, what is it about Richard Harris and the rescue of a dozen Wild Boars soccer players that captures global attention? 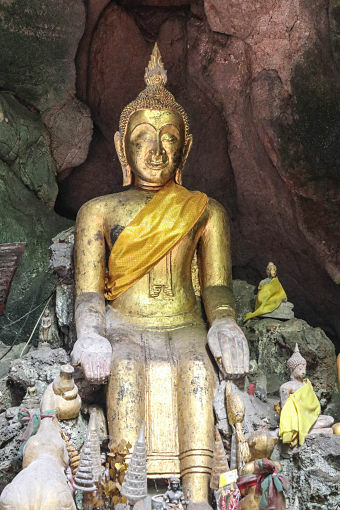 Yes, the rescue from the depths of the Tham Luang caves was a gripping drama; it was the epitome of reality TV with new dangers and possibilities night after night drawn out for over a week of prime-time viewing. A media dream come true for those agencies that could get boots on the muddy ground. And yes, for Aussies, Thailand is close geographically and culturally (you guessed: the owner of our local Thai restaurant had a connection to someone who knew someone …). And yes, in retrospect, what a story! Following the sad death of retired Thai navy diver Saman Kunan, the almost miraculous safe rescue of the boys and coach was a good news story for all the world to celebrate. As one lead diver said: what was expected to be a body recovery turned out to be a rescue. And no, you probably didn’t know that two of the boys as well as their coach are not Thai but are stateless, belonging to ethnic minorities within Thailand, and incidentally making them ineligible to accept the offer of Manchester United football club to visit the UK next season. However, the inspiration and lessons of this story go beyond riveting real-time TV and lives saved. In my view, what we saw during that gripping week in July was human community at its best: individuals finding their place—indeed, finding the meaning of life, for a time at least—in the pursuit of the common good. And what we saw was a challenge and a contrast to so much of what passes for matters of importance among the chattering classes. In an age ruled by economics and the market and the cult of personality, no expense was spared to save the lives of 13 ‘nobodies’ from the northern backblocks of Thailand. There was no rationalist weighing up of the value of a young Thai boy’s life, no thought about whether the operation was ‘worth it’. In an age of egocentric ‘virtue signalling’ and the media quest to bequeath stardom on some, the ‘heroes’ of Tham Luang preferred to get on with the job recognising that their contribution was just that: a contribution to a team effort. “We have a job to do,” said John Volanthen, who found the boys, when asked for comment by the media. I wanted to give credit to all the people in some way involved. Craig and I have had a spotlight on our efforts and we want to make everyone realise that the role we played was no more or less important than all the many hundreds (perhaps thousands) of people I have mentioned. … we just consider ourselves lucky to have had some skills that we could contribute to the wonderful outcome. In an age of tribalism and racism, toxic nationalism, toxic masculinity and toxic feminism, an age of loud fundamentalisms of religious and secularist varieties, an age when difference feeds the culture wars, we saw some 10,000 people, 2,000 soldiers, 200 divers, 100 government agencies from tens of countries and numerous religions, men and women … thinking nothing of those differences in the interests of what they had in common. To plagiarise the Letter to the Galatians, they were “neither Thai nor Aussie, Buddhist nor Christian, neither male nor female, neither heroes nor nobodies,” as their common humanity overwhelmed all difference. In an age of increasing disparity between the very wealthy and those who struggle to make ends meet, rich and poor worked side by side—whether Adelaide anaesthetists forgoing a Nullarbor holiday, or retired Thai SEALs risking and even losing life, or UK cave divers taking time off the 9 to 5 IT job to attempt another rescue, or local Thai farmers pitching in from the beginning to feed the rescue teams at no cost—all social and economic differences ignored in the name of the common good. In an age of victimhood, identity politics and political correctness, once again, the individual and the cost to the individual, even to Saman Kunan’s life, was not the dominant narrative, overwhelmed by the communal goal for which everyone laboured. In an age of political bickering, the sad circus of parliamentary question time, or the juvenile behaviour of two nuclear-armed bully boys on the global stage, how encouraging to see the nations come together in common cause. The rescue of the Wild Boars offers us an inspiring vision of human beings at their best as people from a multitude of nations, tribes, peoples and languages, as well as every economic status, put their hands to the plough. Let’s pray that this story from sleepy Chiang Rai province in the mountains of Thailand might inspire a world desperately in need of solidarity. The Lord knows we need such inspiration as we battle global problems that can only be resolved when community and not difference empowers our joint task of working together in a spirit of solidarity for the common good. Dr Chris Mulherin is an Anglican priest and Director of ISCAST–Christians in Science and Technology. He is a member of the SPC board.